Born on the 31st day January in 1960, David Allen's rode to chess is an intriguing one. Growing up in the industrial Midwestern city of Cleveland, Ohio, David was always looking for intellectual challenges and decided to satisfy his curiosity with chess. In 1971, young David purchased a chess set and as he asserts, "chess has been the perfect thing for 30 years!" Growing up in a strong chess-playing region, David had a chance to involve himself at many different levels in the chess scene. As a successful coach, he coached John Adams High School in 1989 to the State Chess Title and Charles Eliot middle school to state titles in 1992 and 1993. He also has a promising son, David Allen Jr., who he has coached to five state scholastic titles from 1994 to 1998, and is seeking also to become a Master. As a player, David has reached a peak USCF rating high of 2396 in 1991 decided to return to school. David entered graduate school at Capella University, earned his Ph.D. in Information Technology in 1995, and has not had the opportunities to study further. 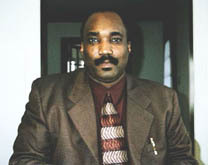 In terms of his personal accomplishments Dr. Allen states, "I have beaten IMs Calvin Blocker, Elena Lopatskaya, and Dimitri Ghizdavu and drawn with several strong players such as Calvin Blocker, Larry Kaufman, Gregory Serper, Edward Formanek, Milan Vukcevich and numerous other 2400 and 2500 players. I have won over 100 tournaments (minor ones) mostly in Ohio but my greatest achievement was being the top 1st board at the 1988 US Amateur Team Midwest Region Columbus, Ohio 5/6 against an average opponent rated 2350!! and also I was the 1996 World Open G/15 co-champion with Kimani Stancil (another up and coming young brother). I plan to hit all the Major Tournaments in 2002 in search of the IM title!" For training, the Cleveland Master uses specialized opening manuals, and databases such as Bookup, and Chess Base. His two favorite books are classic in their essence: Play Like a Grandmaster by Alexander Kotov and The Middlegame by Rueben Fine. His advice for players wanting to improve is to "set aside the ego, be honest, and assess your weaknesses. . . then eradicate them!" 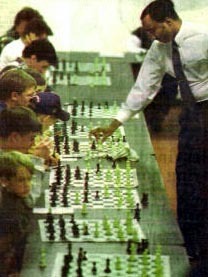 Besides looking for chess victims, the friendly master enjoy computers, Civil Rights issues, and teaching chess to youth.